I have been reading the EDGE for a number of years. I have held them in high regards despite their own “little” bias, as they report much more objectively than our other media and carry less blatant unsubstantiated spins like the AM. But I came to read the Edge argument defending itself on 1MDB case and I think the EDGE have lost it in their journalism standard. (see among others http://greatermalaysia.com/…/the-edge-media-group-lied-to-…/). In essence they knew that the information was illegally/ improperly obtained and had promised to pay a substantial sum for such information. But after being caught they now argue they never intended to pay Justo in full with intent to breach their agreements. Whichever way one looks at it the EDGE was not honorable. Worse they have never ever told us readers that they paid or promised to pay huge sum of money for the information which they knew was illegally/improperly obtained. Unbelievable and a highly disappointing explanation. Taking us for a ride. Now let us see what the EDGE as journalists are obligated to do or be ethical. Under the US SPJ standard that I have alluded many times, this is unethical. They call it checkbook journalism. A form of bribe. 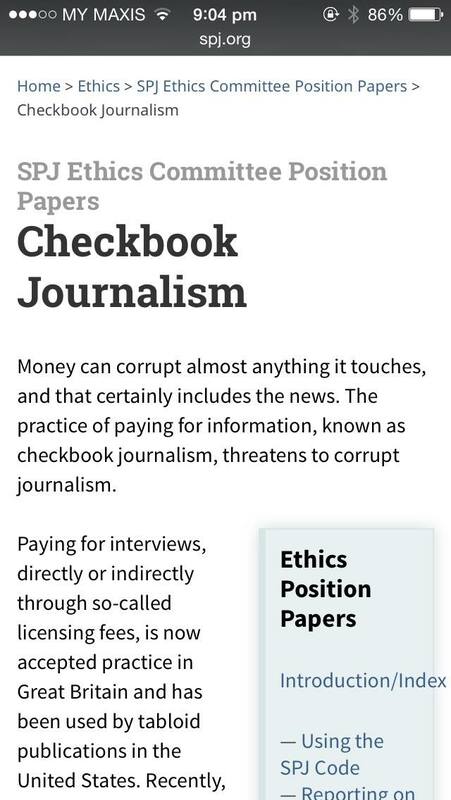 “Checkbook journalism undermines journalistic independence and integrity and threatens the accuracy of the information that is purchased…. First, paying for information immediately calls into question the credibility of the information. Readers or viewers have a legitimate right to wonder whether the source is disclosing this information because the information is important or because the source is getting paid for it. They also can’t be blamed for wondering whether the source is telling the outlet the truth, telling the outlet what it wants to hear or embellishing the truth to increase the value of the information…..
Second, paying for information creates a conflict of interest. By writing a check for an interview, the journalist now has a business relationship with the source…. Accuracy and truthfulness are sacrificed by the EDGE. How could the EDGE do this to its readers. This is what is happening in our country. And I condemn them for their failure to disclose they paid for the information knowing full well it was illegally or improperly obtained. You the EDGE which was supposed to be respectable con us the readers for such failure to disclose. You are highly disappointing and this is not acceptable. I will terminate the subscription of your paper. PS: this does not mean that I’m not asking 1mdb to account for the money as written before which in my view has a heavier and more grievous concerns. But it does not mean that the EDGE was right too. PS: Feel free to share.